A major construction company needed to provide a visual warning of noise levels on a demolition site to avoid noise complaints from neighbours and warn operatives when hearing protection was necessary. There was nothing suitable available so a new product was designed and manufactured to the clients specification. The CNX Industrial Noise Level Indicator was robust enough to be used on outdoor construction sites and provided 360 degree mobile visual noise indication. It subsequetly won an innovation award at the 2014 National Federation of Demolition Contractors (NFDC) Demolition Awards. Music noise levels were too high in a community centre with residential premises above. The centre had a caretaker living in an adjoining flat so the ILX Noise Level Indicator was the ideal low cost solution. The main display unit was fitted in a position clearly visible to DJs so that they were aware of the sound level and an additional warning beacon with a 10 second time delay was installed in the caretakers flat so the caretaker would be made aware if the noise level rose above the chosen maximum for a prolonged period. A school needed to ensure that students hearing was protected whilst playing music in the practice rooms. Musicians were to be given a visual warning when the sound level exceeded 85dB and if the level was not reduced within 10 seconds the power supply to their instruments was to be cut off for a period of 10 seconds and then restored automatically. Lime Technologies recommended the NLX noise limiter with the optional bright compact remote display. The products were fitted by the schools usual electrical contractor with the aid of the comprehensive instructions supplied. The main control unit was fitted, out of sight at a convenient location to connect to the existing mains wiring and the display was fitted at high level in the practice room where it could easily be seen. The remote microphone was concealed behind a ventilation grill in the suspended ceiling in order to prevent tampering. After the introduction of the smoking ban a night club provided an outside smoking area for its customers. Unfortunately loud conversation late at night caused disturbance to nearby residents. A visual warning was required in order to alert door staff if the noise level on the smoking terrace exceeded 80 dB so that they could ask customers to talk more quietly. A noise activated warning sign would have been the lowest cost option but the night club management wanted an early warning to give door staff the opportunity to tackle the problem in a more subtle way. 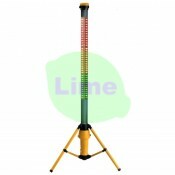 Lime Technologies supplied a Sentry noise limiter with an additional rotating beacon warning light and the Lime Technologies external microphone. Being water resistant the microphone could be permanently fitted outside on the terrace. The trip level for the beacon was set to 80dB but the noise limiter also provided an LED bargraph display from 70dB for advanced warning of potential problem. A wedding venue had had complaints from neighbours due to excessive noise levels from live bands and DJs. The music was played at various locations throughout the venue including a marquee in the grounds. 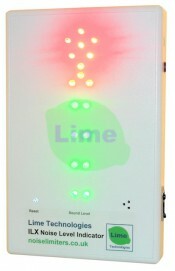 The Lime Technologies plug and play noise limiter was the ideal solution. As a portable unit it could easily be relocated to any point that music was played. It could be set, using a decibel meter to provide a visual warning when the sound level at the neighbours property exceeded 45dB and to cut off mains power from the performers equipment if they continually ignored the warning lights. Urgent Requirement For A Pub. A pub in a residential area was about to be banned from playing music due to a number of complaints regarding noise. They needed a noise limiter urgently so that a planned event could go ahead the following evening. 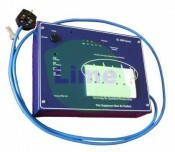 Lime Technologies supplied a plug and play noise limiter on a next day delivery preset to the required 85 dB level. The unit was ready to plug in and required no professional installation. A locking mains socket cover was provided to prevent bypassing of the noise limiter. A small business which manufactured custom metal products had certain machinery / processes which produced a noise level of more than 85dB. Employees did not wish to wear hearing protection when unnecessary but the management had to comply with health and safety at work regulations. A noise activated warning sign, supplied by Lime Technologies was fitted in the affected area. The sign would illuminate automatically when the noise reached a level which could cause hearing damage and workers would be alerted to the fact that hearing protection should be worn. A country house function venue required a plug in noise limiter for use in marquees. The unit needed to be able to supply 30 Amps at 230 Volts and provide a high visibility warning to performers. Lime Technologies custom manufactured a device with three 13 amp mains socket outlets in the front panel together with a 32 amp Ceeform plug and suitable cable. A high intensity flashing beacon was also fitted to improve visibility. The unit was calibrated and tested so that it could be used on the day of delivery.